Philadelphia's premier source for ukulele instruction. Students of all levels, ethnicities, genders, and backgrounds welcome. 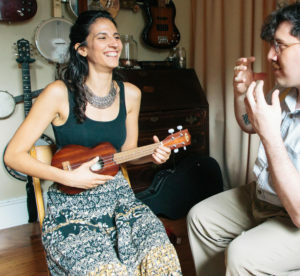 The Philadelphia Uke Studio is your first choice in learning to play the ukulele. Whether you are still picking out your first instrument, or you’re strumming along to your favorite records, you can benefit from lessons with our esteemed instructors. Our teachers specialize in the techniques, applications, and instruction of the ukulele. Many studios will offer ukulele lessons, but few have such qualified and capable instructors.